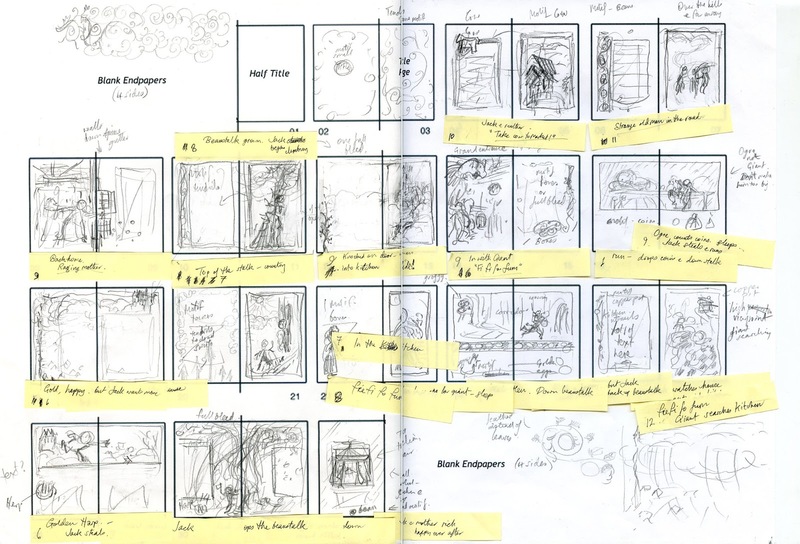 In the second part of a series for illustrators starting out in Picture Books, Words & Pictures Illustration Editor John Shelley takes a look at planning images and layout. So you have a story, and maybe some character studies and other sketched drawings. 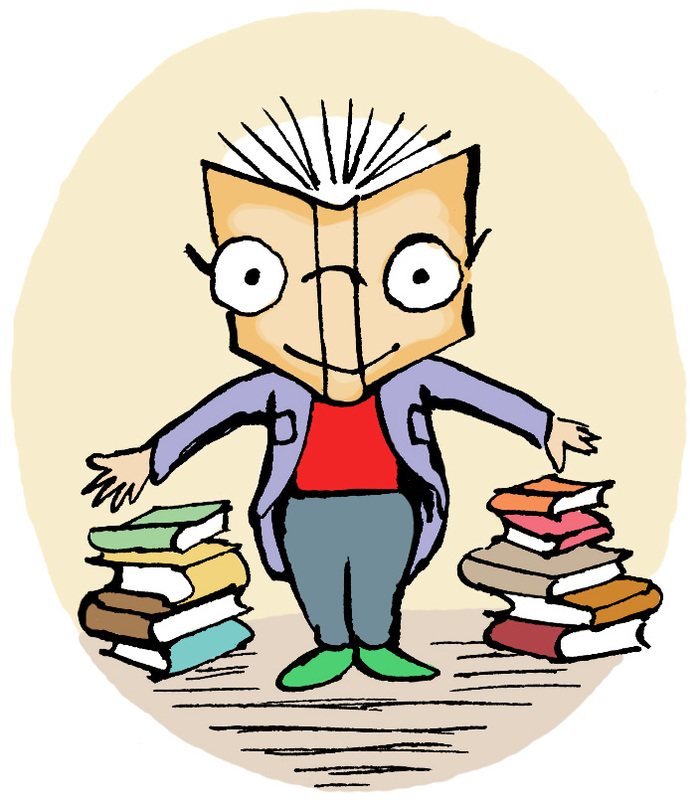 The next stage is to plan out the book and make a dummy. 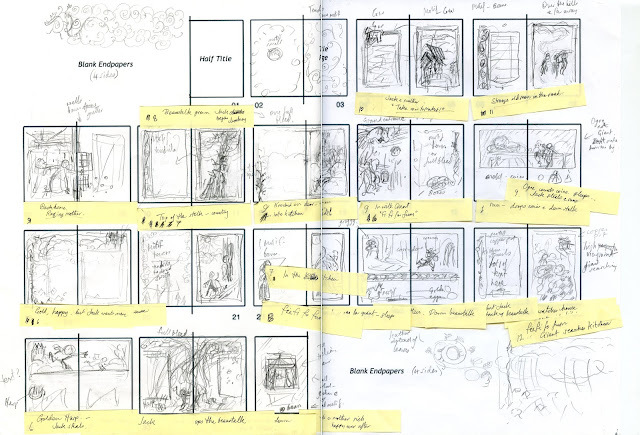 A common starting point for illustrators is to mark out a storyboard on a single sheet of paper, representing the whole book in small thumbnail sized squares. This allows the artist to pencil in the basic design of each page, plan how the story unfolds over the pages, divide up the text, see where the dramatic points are, and consider the rhythm of the images. As the sketches are thumbnail size and very simple it's an easy matter to rub out and redraw. Some illustrators draw tiny sketches or write the text on sticky notes which they can switch around the pages, though I find these have the annoying habit of curling up and falling off! Having roughly planned the book it's time to make larger sketches for each page or spread. Personally I draw pencil roughs at A5 size per page (so A4 for a double page spread) scan these to make my dummy and later enlarge for the final artwork stage, but everyone will have their own method. A small image on a page surrounded by white space focuses on detail, so it might suggest quiet intimacy, or a key-hole view of a drama about to unfold. 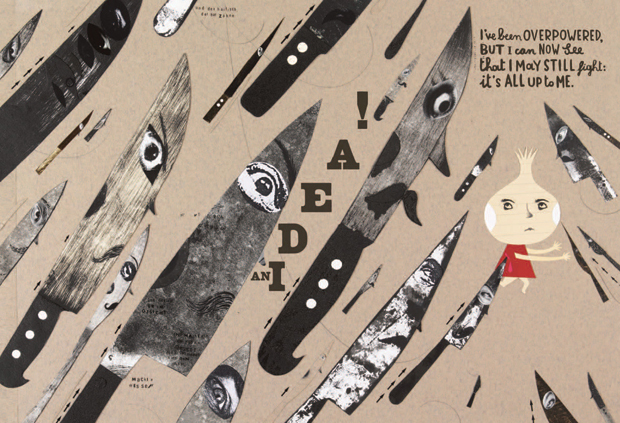 Some books begin with smaller images, then gradually open up to full bleed as the drama unfolds. The reverse can work too - big to small. 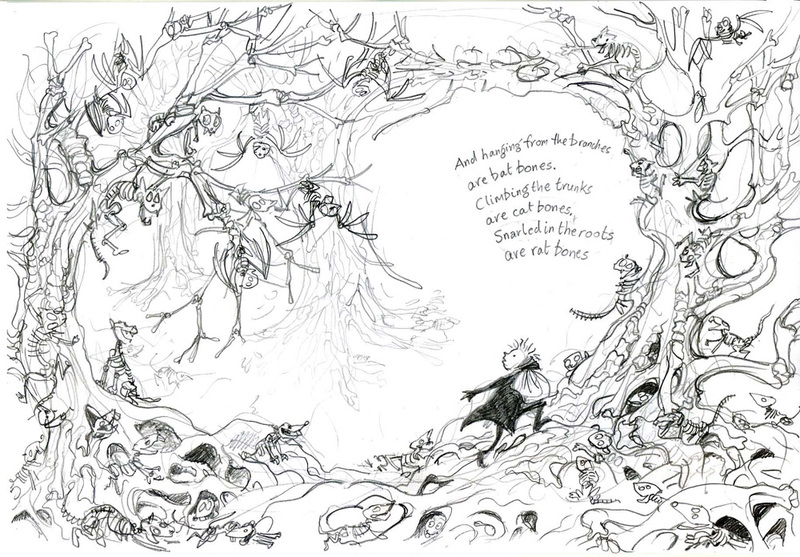 A classic example of this approach is Sendak's Where the Wild Things Are, where the first and last illustrations are small, with very wide white margins, while the central fantasy spreads are full bleed. Another use of small images is to break up a series of actions into details on a page. So for example, a piece of text might describe a character putting on a coat, then shoes, then tieing on a hat... one single image would suffice to cover all these actions, but by separating each into a series of vignettes or spots on a page a sense of time and motion can be introduced. Picture books are a little like songs in that there is usually some kind of pattern or structure that the whole book follows, a regular rhythm flowing through, with choruses of loud, dynamic pages at key stages. It's equally true of both text and illustration. An image near the front of a book might be reflected with a similar design later to create a resonance. A key element of picture books is the need to move the narrative forward - the reader should always be encouraged to turn the page. 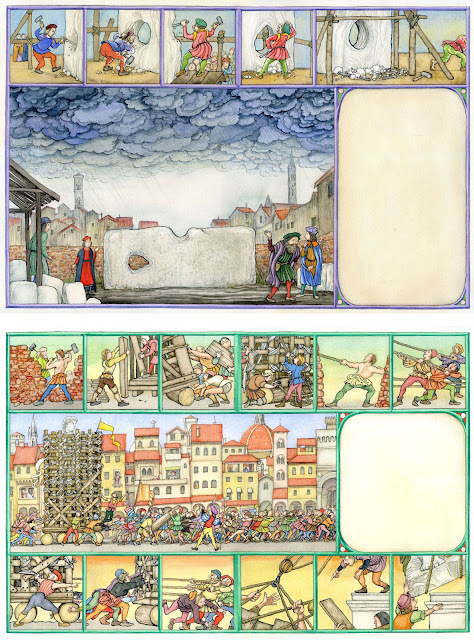 This can be done by building tension and expectation in the image or text, ensuring plenty of movement from left to right, and drawing the reader's attention to the page corners. Well, some of them perhaps. It's not necessary to mix image sizes in a book - regularity works well if the story has a strong rhythm. Full bleed images don't have to be panoramic. Within these basic patterns all kinds of fun can be had by breaking up these types and inventing ways to combine/contrast layouts. In fact this is what makes picture books so interesting. Go wild, be clever, be crazy! But remember, however mad the page layout, the narrative has to move forward, it has to be understandable as a book. The key thing is to follow instincts suggested by the text, do what the story conjures. Remember the gutter (the book's hinge)! Avoid putting busy elements in the part of the book closest to the spine, they'll be lost in the final product. Be especially careful not to place key characters in the gutter! Consider the text - where will it lie? How much space will it require? Will it run over the illustration or be separate on the page? Likewise, leave a good gap between text and the gutter and page trim. Page design is a big topic with myriad aspects. It's a good idea to peruse a lot of picture books and examine how other artists solve the challenges of page layout. 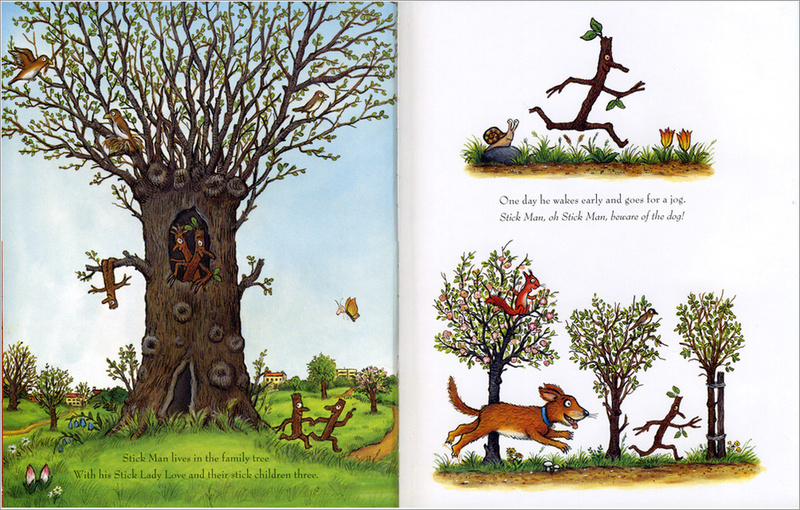 There's also a lot of inspiring stuff on the Web if you dig around - for example Design of the Picture Book is a useful resource. 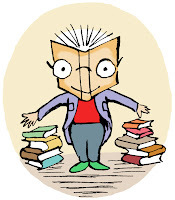 Some illustrators make very elaborate dummies before submitting to publishers, but editors frequently say that a dummy that is too polished can actually make it difficult to consider the story. It's often recommended that artists sketch out spreads in simple black and white roughs, nothing too complicated, overlay the text, and draw just one or two finished images in colour to give an indication of the final look. Personally I sketch all my dummies in pencil on loose sheets, scan in to Photoshop, adjust, then lay out using InDesign, adding the text. I might spend a long time tweaking, changing around and so on before I'm happy with the result. Finally I'll save as a lightweight .pdf which I can then either email to my agent/art director or print out, clip into a plastic file and show as a physical dummy. Hey John, Great article! Nice tips on laying out images. I have been using software like Pixelmator and Sketchbook Pro which are awesome. Photoshop etc is just so expensive. I have not found anything which competes with InDesign yet apart from SwifPublisher which is getting good - only problem is you can't layout pages side by side yet which is a killer. I'll be signing up to SCBWI over the weekend. Looking forward to getting involved and hopefully lots more meetings etc in Norwich! Nicely presented John, thanks for the tips. 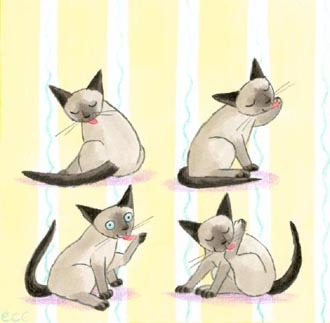 Great advice and lovely sample illustrations! John, this is a excellent part 2! Thank you so much, I've learned a lot. Brilliant. I adore finding out how picture books are put together, even though I can't illustrate (naturally nosy!). That is so insightful and useful John, thank you! 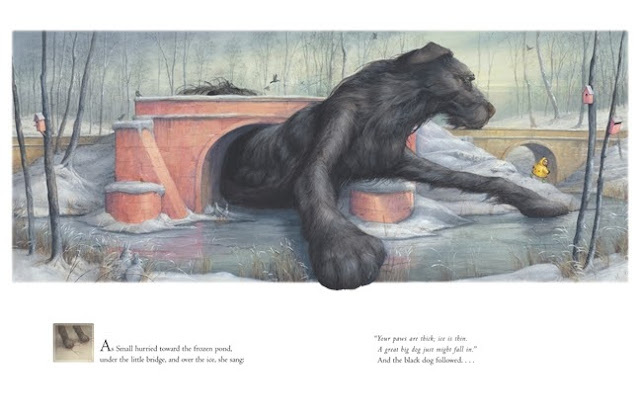 An excellent range of sample illustrations and presentation on picture book basics John. BigLittleTales have tweeted you! these posts would make a good book, John - thanks! What a great, well-written and illustrated synopsis of method! Thank you! Keep coming back to this! Thanks John. Well post its tell us how to make sketches for your picture that's great idea for making a picture book thanks for share it ksa writers . Thanks so much! 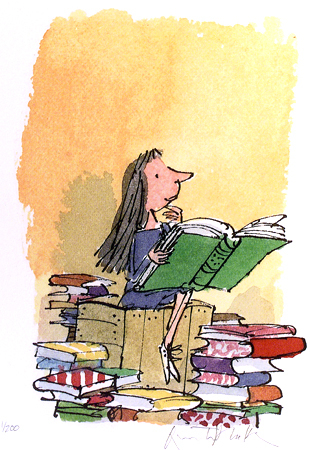 Re-doing a children's book with a new publisher today and your article is very, very helpful. I found this very helpful for me. I am a first timer children's book illustrator and life time artist and I was doing research and came upon this article. Very interesting and enlightening. Thank you.